Please see individual varieties for specific product information, but in general the growing information will be the same for all varieties of okra. The majority of the information on this page was provided by the University of Arkansas Cooperative Extension Service Okra Home Gardening Series; download the complete pdf file with FAQ’s for more information or click here to visit the website. When To Plant: You can plant okra from seed or from transplants after the risk of frosts passes. Charley recommends a late April or early May planting with transplants. Shorter days promotes flowering which increases yield. Okra planted in late spring may remain vegetative (grow vigorously but not produce okra) until late summer or early fall. 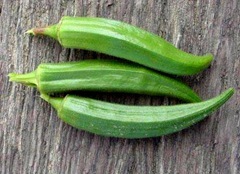 Planting Tip: Clemson Spineless Okra is not as sensitive to day length as other okra varieties. For early okra, use black plastic to warm the soil then cut holes and plant through the plastic. 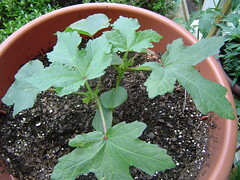 Preparation and Care: Okra will grow well in most any type of garden soil. Fertilize your soil with a complete 10-20-10 fertilizer prior to planting at a rate of .3-.4 pounds per 10 foot row. Okra will stay vegetative if there is too much nitrogen which will result in low yields. Hoe your okra to keep the weeds under control. Okra flowers are only open for one day and usually self-pollinate. Watering: Water your garden once a week with a 8-12 hour soaking. This will allow the soil to absorb an adequate amount of water and also limit the time you spend each week watering. If you use a sprinkler to water, do this during the day so that the plants will have some time in the evening to dry out before dark. This will limit the chances of disease. If you use a soaker hose, you can water at night. Watering with a soaker hose at night is best as it limits the amount of water lost to evaporation and keeps the plants dry which limits the chances of disease. During dry periods you may need to water more often (every 4-5 days), and watering at night is important in water conservation during droughts. Fertilize: During a long growing season, add a side-dressing of fertilizer using the Charley Method of one handful spread along 2-3 feet of row. Harvesting: Cut okra when the pods are young and tender and 2-4” long. Okra is ready to harvest 4-7 days after the blossoms open. Pick okra every other day and remove mature okra and discard to keep the plants producing. When the okra pod stems become difficult to cut, the okra is too old. Okra will keep producing until frost. Southern Blight – remove suspected plants immediately. Crop rotation is the most effective means of control.